Energy Tip of the Week! Following on from all the lovely people we met at our stall at Wilmslow Artisan Market earlier in November…. Their main concern at this time of year? What to do about CONDENSATION – on windows, and even on walls in some houses. Do you want to know where your house is losing heat? Sign up for an energy survey. 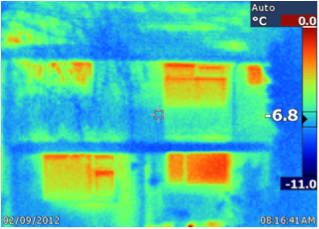 One of our volunteers will use a thermal imaging camera to pinpoint the problem areas and offer advice to put it right. This entry was posted in Energy, Uncategorized and tagged community, energy, energy efficiency, environment, housing, Sustainable living. Bookmark the permalink.